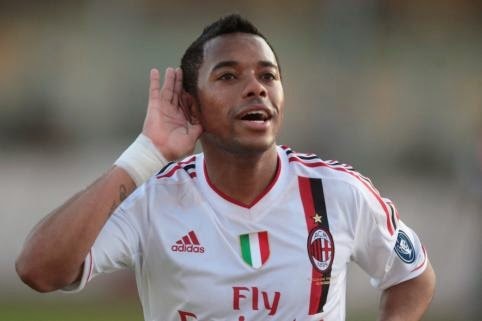 Robinho could be joining Kaka in MLS with Orlando City SC. Just days after Kaka was announced as the new DP signing of the upcoming MLS team, Orlando City SC, it looks like their shopping in Milan is not finished yet. Reports are resurfacing again that Robinho will be one of their desired players to partner up with Kaka as they prepare for their 2015 MLS season. Robinho is still an AC Milan player but he could negotiate a similar deal as Kaka did and see himself become a free agent and able to sign with the new MLS side. Kaka will be having a loan spell at Sao Paulo until the start of the 2015 MLS season, but it is not clear if Robinho would try to secure a similar deal or if he would just come to the USA and wait there for the start of the new season. He has told friends that he wants to finish his career in North America, and would like to play with his former team mate. It looks like the stars are aligning themselves to provide Orlando with another incredible signing as they prepare for their first season in MLS.